Margaret Atwood (1939 - )) -- literary critic, short-story writer, poet, social historian, children's author, novelist and satirist. Published in more than twenty countries and many languages, Atwood, with her perceptiveness and biting wit expressed through her strong female characters, has made her presence felt in world literary circles and by much of the general reading public around the globe. She studied at the University of Toronto and Radcliffe College in Massachusetts. Some of her works have been adapted for screen and stage including an adaption of The Handmaid's Tale for screen by British playwright Harold Pinter, Alias Grace (film), The Blind Assassin(mini-series), The Edible Woman (play); and The Robber Bride (screenplay). 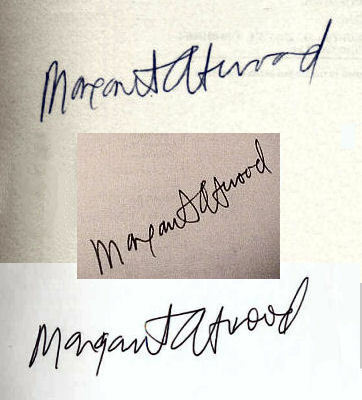 Atwood is the recipient of many literary awards and prizes: the Giller Prize (Canada) and Premio Modello Prize (Italy) for The Robber Bride and Alias Grace; the Arthur C. Clarke Award for Best Science Fiction for The Handmaid's Tale; the Governor General's Literary Award for Poetry (Canada) for Circle Game; short-listed and/or finalist for the Booker Prize on several occasions; winner of the Booker Prize for The Blind Assassin, awarded the Norwegian Order of Literary Merit, etc. She currently lives in Toronto, and has lived in many other parts of the world including France, England, Scotland, and the United States.